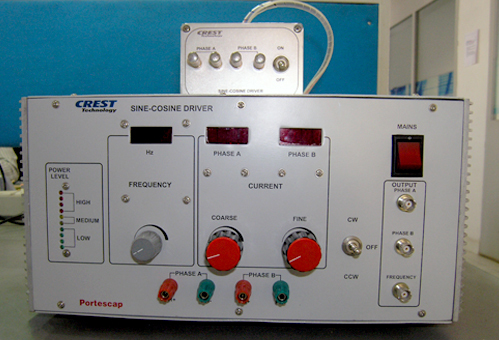 Sine-Cosine Driver – Crest Test Systems Pvt. Ltd. 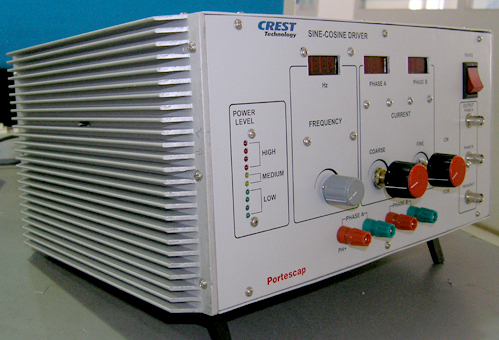 The Sine-Cosine Driver is used to drive Bipolar Stepper motors and Disc Magnet motors for evaluating the noise and vibration performance of the motors used in critical applications. The signal generation and amplification stages of the Sine-Cosine Driver are based on pure analog circuitry which results in a very low harmonic distortion output. The driver uses two independent high-compliance adjustable current sources for driving the Bipolar Stepper and Disc Magnet motor windings. The driver output frequency is also adjustable for precise noise and resonance evaluation at speeds of 10 to 4000 RPM. The RMS current for each phase and the frequency are displayed on independent digital displays. Necessary indications and protections are provided to prevent the driver amplifiers from getting damaged due to an overload condition.